The world of ecommerce never rests. Gone are the days when spending events were all about the next big holiday in Q4. With competition so tight, you have to target different holidays and events throughout the year to successfully grow your online business. 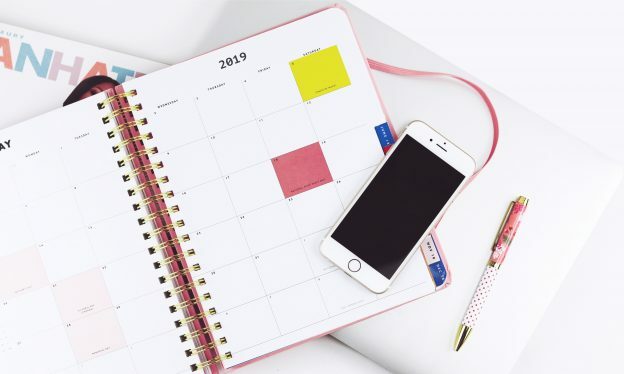 To save you some time, we put together a holiday ecommerce marketing calendar that gives you a quick summary of dates and holidays you can use to make 2019 your most profitable year yet. In ecommerce, every day is a celebration: from Stuffed Mushroom Day in February to Pi Approximation Day in July. But with so many occasions to mark, it’s important to understand which of these exciting days and events are the most suitable for your business. So let’s start with the basics – holidays and spending events that are a must-have on any marketing calendar. 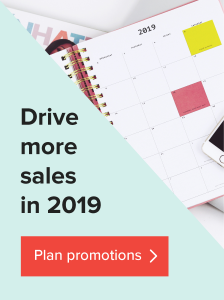 Now that you have the foundation for your 2019 holiday promotion plan, keep building it around your niche. 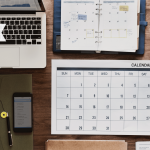 We’ve compiled a list of exciting dates that you can add to the calendar you already have to generate more sales this year. Sometimes holiday campaigns go viral for all the wrong reasons. To avoid this happening to your business, pick the occasions that align with your brand and target audience. Research the meaning behind these events too, and follow your moral compass. The first quarter of the year is about reconnecting with the customers who discovered your store during the final shopping spree of the previous year. Concentrate on building relationships with your customers and encourage retention and loyalty. New Year’s Day is a fresh start. For the first week of the new year, build your marketing campaigns around New Year’s resolutions, bucket lists, and 30-day challenges. While the majority of people have their Christmas spirit tucked away by January, the festivities in the Orthodox Christian community are still in full swing. Eastern Orthodox churches base their liturgical calendar not on the Grigorian, but on the Julian calendar, according to which the birth of Jesus Christ is January 7th. So if your target audience is based in Russia, Ukraine, Israel, Egypt, Bulgaria, or other countries with Orthodox communities, consider running your Christmas campaigns a little longer. Perfect for promoting the hats on your store, launching new designs, or adding hats as a new product. According to this tradition, on February 2nd groundhogs wake from their winter slumber to peek out of their burrow and look at the world. If they see their shadow, they go back inside, which predicts six more weeks of winter. If they don’t – spring will come early. Even though Groundhog Day isn’t a holiday, it’s a good opportunity to run fun promotions on your store. Super Bowl Sunday is the culmination of each National Football League season. For many Americans, the annual championship game is the sporting event of the year. In fact, this final game is so popular, 1 in 4 Americans say the day after the Super Bowl should be declared a national holiday. You don’t have to sell football-related products to target this event. Play around with the theme – share social media photos, offer a discount code, or let your audience know what team you’re rooting for. Chinese New Year is a festival that begins on the second new moon after the winter solstice and ends on the full moon fifteen days later. The festival marks the start of the new year, and each year is assigned one of the 12 traditional zodiac animals. 2019 is the Year of the Pig – something that can be incorporated into your marketing campaigns. The Grammys are a renowned music event that celebrates the musical achievements of the year. This event is a great opportunity to connect with your audience and grow brand recognition. You can start a conversation with your customers about who’s going to win in certain categories, or even run a little giveaway. Valentine’s Day is a celebration of love and romance. And even though on this day people usually give small gifts to loved ones, but you can encourage your audience to celebrate friendships and other meaningful relationships, too. 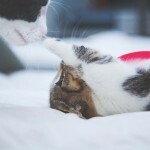 Think outside of the box when preparing this year’s Valentine’s Day marketing campaigns. Instead of offering yet another discount code, make a Valentine’s Advent calendar. Use it as a 14-day marketing campaign that celebrates all kinds of love. February 18th in Canada is Family Day, a federal holiday during which families get to spend time together. Even though it’s not a huge spending occasion, it’s one of those events you can use to communicate your brand values. The Academy Awards ceremony is one of the biggest events in the film industry. Use this day to talk movies with your followers on social media, or share timely comments about the ceremony to help you grow brand awareness. Leonardo DiCaprio’s Oscar win in 2016 generated more than 440,000 tweets per minute. It was the most-tweeted 60 seconds of an Oscar’s telecast. While fans and celebrities celebrated Leo’s success, brands used it as opportunity to engage with their followers. If you offer dresses of any kind on your online store, or accessories that can make or break a look, this day is definitely worth marking on your marketing calendar. Run a flash sale to generate more sales, or a giveaway to grow brand awareness. International Women’s Day celebrates women’s equality and contributions to the world. If this day is an important part of your brand, be sure to celebrate it. Tell your story, share a friendly discount, or run a charity campaign to support local or international community that helps women in need. In countries like Japan, South Korea, and Taiwan, women celebrate Valentine’s Day by giving chocolates and handmade gifts to their boyfriends, male colleagues, and friends on Valentine’s Day. A month later, on March 14th, the men reciprocate the gesture. On this day, online shoppers go after custom-made apparel, accessories, and jewelry. And if you’re offering any of these, White Day might be a perfect time to target customers in Southeast Asia, whether you already have a presence there, or you’re interested in building one. St. Patrick’s Day is a celebration of Ireland’s heritage and culture that usually involves parades and festivals. On March 17th, people make an effort to wear shamrocks-shaped accessories or anything green, really. If you want to run marketing or sales campaigns on St. Patrick’s Day, be extra cautious. Some think, that it’s becoming too commercial and give a misrepresentation of the Irish. Holi is the traditional Hindu festival of colors that celebrates love, fertility, and the advent of spring. Apparel, jewelry, electronic items, and footwear are particularly popular around this time. With the weather getting warmer in the second quarter of the year, people spend more time outdoors and start making camping, festival, and wedding plans. Well, that’s a common scenario for people living on the Northern hemisphere. But remember that some of your customers might be living down South, which means they’re actually gearing up for the wintertime. So pick your campaign themes wisely. In the Western world, people know that on April 1st they’ll probably be pranked in one way or another. As a store owner, you can use this day to show your sense of humor. A good joke on social media, or a short video can go a long way in growing brand awareness and driving engagement. Celebrated around the world, Sibling Day honors the unique relationship siblings share. Like Mother’s and Father’s Day, Sibling Day is for spoiling your brother or sister with a gift, card, or inviting them to spend some quality time together. Personalized or matching items like “Best brother/sister ever” are perfect products for this day. But don’t be afraid to think outside of the box. At the end of the day, it’s all about tailoring your offer for the occasion. 68% of US households (about 85 million families) have a pet. And while most of these families shower their loyal companions with love every day, National Pet Day encourages people to pay special attention to pets who need extra care. Even if you don’t offer products related to pets, you can use National Pet Day as an opportunity to connect with your customers. For example, show the pets behind the brand, or share your thoughts on why this day matters to you. Coachella is one of the biggest music festivals in the world. The annual six-day festival that features A-list musicians and celebrities isn’t just about the music, but also about art and fashion. Weeks before the event, Coachella goers are going to raid stores for outfits and accessories that will make them stand out. Your store can help them on this mission. If you like the idea of marketing around events like Coachella, check out this list of the world’s biggest music festivals. Good Friday, Holy Saturday, and Easter Sunday commemorates the crucifixion, death, and resurrection of Jesus Christ. Even though Easter is often considered a more important Christian holiday than Christmas, it’s not as commercial. However, with every passing year, business owners are investing more time in preparing spring sales around Easter, offering special deals on clothing, seasonal decor, and home goods. April 22nd marks the anniversary of the environmental movement founded in 1970. On this day, countries around the world hold various events in support of environmental protection. If this cause is important for you and your business, make sure to let your customers know about it. Share your thoughts, personal story, or introduce a product that supports the movement. You can even create a charity campaign. Mother’s Day celebrates mother figures in the society. In the US it’s the third-biggest spending holiday of the year. If you want to grow your store, it’s worth going an extra mile to put together heart-warming campaigns for this Mother’s Day. Keep in mind that Mother’s Day isn’t celebrated on the same day around the world, so do your research. Little known to non-Europeans, Eurovision is an annual international song contest famous for its entertaining and cheesy performances. If you’ve never heard of this contest before, imagine American Idol, but with artists from different countries competing for the prize. Whether it’s music or a little bit of competition you or your audience enjoys, this might be an event worth speaking about on your social media channels. Celebrate with your customers by offering a small discount or free shipping to Canada. Memorial Day is a federal holiday in the United States for remembering the people who lost their lives serving in the country’s armed forces. Marketing around events that have a serious cultural significance can be risky. So before you post that discount code or social media update, take a moment to re-evaluate your language and nature of your promotion. There’s no clear history behind Best Friend Day, but that doesn’t stop people around the world from marking the occasion and spoiling their close friends with attention. A picnic in the park, a chat over coffee, or a matching set of t-shirts are only a few ways your customer might want to surprise their best friends. Even though Father’s Day isn’t as commercially present as Mother’s Day, it’s still an event to remember and celebrate. Like with Mother’s Day, different countries celebrate Father’s Day on different dates, so double-check when your target audience most likely celebrates fatherhood. Yoga is a physical, mental, and spiritual practice that originated in India and took the Western world by storm. If you’re offering activewear or products that are in some way related to yoga, June 21st is the day you don’t want to forget. By this time, summer’s in full swing and so are the joys that come with it – outdoor activities, traveling, sightseeing, you name it. By mid-summer, however, people are slowly preparing for the back-to-school season. So be smart about your campaigns and communication plans. Canadian Independence Day is celebrated similarly to other holidays of the kind – with country-wide events, parades, and picnics. Whether you’re Canadian yourself, or you noticed you have quite a few orders going to Canada, July 1st might be worth putting your marketing calendar. Similarly to Victoria Day, you could offer free shipping to Canada. No other holiday brings Americans together like the 4th of July. Believe it or not, last year people all over the country spent $7.1 billion on food, decorations, and activities in preparation for this day. If you offer any of these in your store, try livening up your July campaigns with some patriotic spirit to sell more in July. On this day, book lovers celebrate reading and literature. People are encouraged to put away their smart devices and pick up a book instead. Even if you’re not selling book-related products on your store, you can use this event to share what you’re currently reading or ask your audience about their favorite books. In the Northern Hemisphere, the academic year starts in August or September, and January or February in the Southern Hemisphere. It’s a day filled with exciting reunions and anticipations for the next school year. Treat the students and parents among your audience with a greeting or special promo. Studies show that nearly 57% of brands see their sales spike in the fourth quarter. However, before you jumpstart your holiday preparations for the busiest season of the year, don’t forget about a handful of fall spending events. Labor day celebrates the achievements of workers. 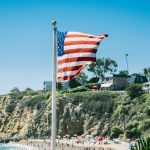 It’s a federal holiday which means there usually are public celebrations, such as fireworks displays, picnics, and barbecues. Labor Day weekend is often associated with the end of summer and for many retailers and shoppers, it’s a time to start planning a new season’s worth of outfits. Many European, Asian, Central and Southern American countries celabrate Labor Day on May 1st. Oktoberfest is the world’s largest beer and folk festival held in Germany. It attracts more than 6 million visitors from around the world every year. If you can picture your audience unwinding with a nice brew, build your marketing efforts around fun content, costumes, and of course, beer! Thanksgiving in Canada is a family a family holiday where people give thanks for the past year. Families prepare special meals and dine together. It’s a great time to thank your customers for trusting and supporting your business. Celebrated on October 16th, Boss’s Day is meant to strengthen the bond between employers and employees. Quirky office gifts like posters, mugs, and t-shirts make great presents on occasions like this. And in case you sell any of these, you can to reach employees who like their employers before October 16th comes around. And don’t forget to target people that are self-employed or freelance. Since they’re their own boss, they may want to treat themselves. Diwali, also known as the festival of lights, is one of India’s most popular holidays. Celebrated every autumn, it honors the victory of good over evil and brightness over darkness. In preparation for Diwali, families spend days cleaning and decorating their homes. They also shop for new clothes and accessories to wear during the festival. Widely celebrated in most Western countries, Halloween is not your typical honor the dead holiday. On this day, people wear costumes, watch horror movies, carve pumpkins, and go trick-or-treating. Use Halloween to breathe some spooky into social media campaigns, run a special promotion on potential costumes or decorations, or share how your brand celebrates the day. Veterans Day honors and thanks all military personnel who served the US in all wars, especially veterans. It’s a day to commemorate, not commercialize, so be extra careful with your campaigns if you don’t want them to turn into a PR nightmare. Remembrance Day in Canada, Australia, and the UK commemorates people who sacrificed their lives in armed conflicts. Weeks before this day many people wear red poppies, a symbol of remembrance, on their clothing. Once again, be extra sensitive when creating campaigns on public holidays like this. Single’s Day started as a student tradition in China in the mid-1990s. On this day, single friends would spend time together eating out, going to movies, and shopping. However, November 11th took an unexpected and more commercial turn in 2009 when one of the biggest ecommerce companies, Alibaba, decided to run its’ first Single’s Day sale. Fast forward to this day, Single’s Day is one of China’s biggest annual spending events. Fun fact: In 2018, Alibaba broke a record by generating $30.8 billion in just 24 hours. Celebrated nationally, Thanksgiving originated as a harvest festival when the first pilgrims shared their food with Native Americans. Today families and friends get together for a meal to give thanks for what they have. Just like on most Thanksgivings around the world, this day is a great time to stop for a moment and think about what you already have. Many businesses use this day to thank their customers for being with them. Black Friday is a shopping day after Thanksgiving that is known for its crazt deals and the crowds that go crazy for them. 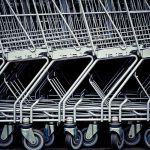 As an ecommerce business owner, you simply can’t afford to miss Black Friday. That said, the earlier you start preparing your Black Friday marketing campaigns, the better! Created in 2010 by American Express, Small Business Saturday aims to draw attention to small business owners by encouraging customers to support local businesses rather than industry giants. If you’re a small business owner, November 30th might be a great time to share the story behind your brand, or your brand values and beliefs. Running special promotions is one of the ways to target Small Business Saturday too. The Monday after Black Friday is known as Cyber Monday – the biggest online spending holiday to date with more than $7.9 billion spent in 2018 (19,3% more from a year ago). On this day, retailers offer even higher discounts than on Black Friday, and as recent years show, people tend to shop on Cyber Monday more! Coined by eBay in 2007, Green Monday is “celebrated” on the second Monday of December. Some like to say that Green Monday is centered on the panic that sets in when people realize they’re running out of time to buy Christmas gifts. IT’s a perfect time to strengthen your marketing efforts and attract more holiday customers to your online store. On this day, online stores around the world offer free shipping. It’s yet another try to keep customers shopping after the Black Friday – Cyber Monday craze is over. Knowing that free shipping is a number one incentive to shop online more, running a special promotion might be one of the last chances to get a few more holiday shoppers to fill their carts. Hanukkah, also known as the Festival of Lights, commemorates the victory of Jews in a battle against the Greeks over 2000 years ago to practice Judaism without restriction. If you decide to add Hanukkah to your marketing calendar, be aware that it’s not related to Christmas and make sure you understand what this holiday means. Even though some families still exchange gifts, this time is more about spending quality time with your family. That said, candles, decorations, and other products that can be used to create a cozy atmosphere at home are things that you can run promotions on. These two dates mark a religious and cultural holiday for billions of people around the world who celebrate the birth of Jesus Christ. Even though Christmas is becoming more commercial every year, don’t forget that it’s a family holiday. So base your marketing campaigns on heart-warming ideas and wishes. Boxing Day is a national holiday celebrated in a number of countries that were previously part of the British Empire. On this day, people spend with family or friends. Even though some believe that Boxing Day can be traced back to medieval times, today, it’s mostly considered an extension of the Christmas holiday and shopping. Kwanzaa is a 7-day non-religious holiday during which families come together and honor their African heritage. During each of the seven days, a candle is to recognize one of seven core values, or Nguzo Saba. On the last day of Kwanzaa families fest together and exchange gifts. The presents are usually homemade rather than store-bought. So if you want to target this holiday, build your marketing efforts around values and beliefs of the African heritage. The last day of the year is usually celebrated with social gatherings that often include dancing, eating, drinking, and watching fireworks. It’s also the time to show off your fanciest or quirkiest party outfit. Businesses send New Year’s wishes to their customers, reflect on the past year, or run special promotions, usually on products that can be used in the preparation of the event. Every holiday or major event is an opportunity to grow your brand awareness and drive sales, so use it to your advantage. In order to see results, you need to start preparing your holiday marketing campaigns ahead of time. Once you fill up your holiday marketing calendar, put your marketer’s hat on. Remember that well-timed creativity and playfulness can go a long way in building relationships with your customers. Be honest and transparent – people appreciate that. Is there an event that we didn’t mention that deserves a place on this list? Let us know in the comments below! Subscribe to our blog and get your free ecommerce holiday calendar for 2019! Hi Beth, you need to decompress the file in order to open it. Nice calendar! The Download Now button appears not to work. Could you please fix and/or email it to me? Kwanzaa should be added for December 26th – December 31st. Similar to Hanukkah, each day has gifts and apparel for celebration.